William Edward Lux, 93, of Delhi, Iowa, formerly of Hopkinton and Manchester, died at his home on Friday, February 8, 2019, after a two-year battle with cancer. He was born on October 17, 1925, in Hopkinton, the son of Russell Ellsworth and Jean Jewell (Kirkwood) Lux. Bill was baptized at the Methodist Church in Hopkinton. In 1943 he graduated from Hopkinton High School and then enrolled at Cornell College in Mt. Vernon. In December 1943, Bill was inducted into the U.S. Navy and inducted into active service in March 1944. Bill met his future wife, Rosemary, at a USO dance in South Bend, Indiana, while attending Officer Training School at Notre Dame. The USS Battleship California was sunk at Pearl Harbor, then raised and re-entered into service. It was then that Bill served on the USS California in the Pacific Fleet, assigned to Okinawa, and was mustered out in June of 1946. He then returned to Cornell College. On June 15, 1947, William Edward Lux and Rosemary Andrea Craven were married at South Bend, Indiana. To this union were born four children: James, David, Jonathan “Scott,” and Julia. Bill attended Iowa State University, completing his bachelor’s degree in poultry husbandry. Bill and Rosemary moved back to Hopkinton in 1949. There, Bill and his brother Bob owned and operated Lux Leghorn Land Farms, a poultry breeding farm, chick hatchery, and feed mill, continuing the business established by their parents in the 1920’s. After 62 years of marriage, Rosemary died in 2010. On June 16, 2012, Bill was united in marriage to Marcheta Roberta (Furman) Cooey. The couple made their home at Lake Delhi. Bill was a member of the Hopkinton United Methodist Church and the Manchester United Methodist Church. 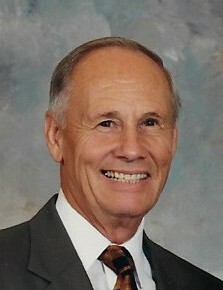 He served on the United Methodist Board of Global Ministries and traveled throughout Africa providing mission oversight. He also served on UMCOR, traveling to the Philippines. Bill served on the Iowa Ecumenical Affairs Committee and was elected to the General Conference of the United Methodist Church from 1984 to 2004. He felt honored to be able to devote 40 years of work and support for many Christian missions, one of which was Heifer Project, which seeded livestock to individuals to improve their food and economic sources. Bill enjoyed sharing his faith and mission projects of the church, speaking to many congregations throughout Iowa and beyond. Bill served as president of the Hopkinton School Board and of the Maquoketa Valley School Board. He served on the board of Citizens State Bank and as treasurer of Rust College in Holly Springs, Mississippi, and was active in numerous other civic and volunteer organizations. Bill loved sports. He played football and basketball for Cornell College, baseball for the Hopkinton team, and followed Iowa wrestling and football. He was an avid tennis player well into his 80’s. He loved classical music, folk music, a great band, and singing hymns. He loved the farm fields and woodlands of Iowa and traveled extensively throughout the U.S. and six continents. Bill especially loved and was proud of his children and grandchildren. His goal was to live the life of a godly man; a godly husband; a godly father; and a godly grandfather. Bill will be remembered most for his smile, his congenial spirit, his love of God, and his desire for you to know that God loves you. Left to cherish his memory are his wife, Marcheta Cooey Lux of Delhi; one brother, Robert Kirkwood (Gloria) Lux of Scottsdale, Arizona; two sons, James William (Annette Andrews-Lux) Lux of Clinton, Washington, and David Andrew (Cindy) Lux of Cedar Falls; his daughter, Julia Kay (Craig) Thompson of Strawberry Point; a daughter-in-law, Patrice Lux of Louisville, Kentucky; one stepson, Ralph (Donna) Cooey of Longmont, Colorado; one stepdaughter, Deborah (Tracy) Knake of Delhi; a step-daughter-in-law, Barb Cooey (Danny) Shaffer of Potosi, Wisconsin; 13 grandchildren, Chris Lux, Christina Lux, Joshua (Trisha) Lux, Matthew (Claire) Thompson, Jared (Leah) Thompson, Mark (Carrie) Thompson, Anna (Sam) Danforth, Jonathan Thompson, Caleb (Susan) Lux, Christian Thompson, Nathan Lux, Shannon Lux, and Ashlyn Lux; 10 step-grandchildren, Jim (Linda) Pingel, Jody Cooey, Ryan (Monica) Cooey, Justin (Cali) Thole, Kamin Loney, Candace (Dave) Meredith, Tyler (Katie) Cooey, Breana (Carson) Ray, Miranda (Adam) Kracke, and Austin (Kathleen Galloway) Knake. Bill was preceded in death by his parents; his wife, Rosemary; his son, Scott; one brother, Russell “Buster” Lux; and a stepson, William Cooey.